It all came together very quickly. Alex had studied microfinance and at the last minute decided to put his degree to work abroad; ELI had just started a program with microfinance opportunities in its newest location - Cambodia. A few weeks later, Alex found himself in Phnom Penh, in what proved to be a stunningly good internship match for everyone involved. For the next four and a half weeks, Alex focused on the nonprofit’s program, researched microfinance in Cambodia, and wrote up a proposal. His work was independent and self-directed, perfect for someone with his academic background. The presentation blew them away. What Alex put together was nothing short of a comprehensive game plan. From showing staffers how to implement and use key business impact measurement tools, and outlining the synergistic and logistical benefits of involvement with other nonprofits, to researching key potential donor institutions, Alex set up the group on a strategic path to growth. He included such nuts-and-bolts details as client and fiscal tracking and specific benchmarks the group had to achieve. “I got to be the manager, in a way,” Alex says, noting he had to adjust many of his expectations so that they were in tune with the very different way of doing business in Phnom Penh. Alex’s work with his former Cambodian colleagues continues to this day, even though he’s been back in the U.S. for a couple of months. 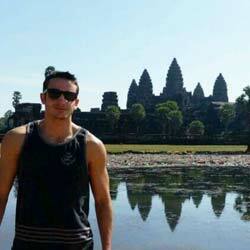 Although he worked hard in Phnom Penh, Alex made time to explore the city. It helped that he lived in a centrally located volunteer hostel in an area popular with budget travelers. On weekends, he hit the road. 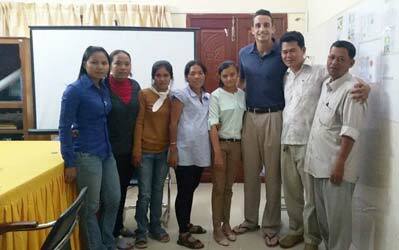 The lasting impact that Alex has had in Cambodia cannot be overstated. He’s an example of the enormous difference one skilled and dedicated person can make. His advice for prospective microfinance interns? There are many microfinance organizations in Cambodia, he adds, and plenty of opportunities for the well-prepared intern. Business and accounting students, are you listening?